Whether painful or not, black toenails are a cause for concern for most people since they are so noticeable that you will not help but notice them every time you slip on a pair of flip-flops or open shoes. Why do toenails turn black? Are there any measures that you can take to prevent and get rid of darkened toenails at home? When should you seek medical attention about the problem? Unlike yellow and green toenails, black toenails do not indicate a change in the color of the nail plate itself. They are more often than not the result of injury to the underlying skin or any other factor that causes a change in color of the tissues underneath the nail plate itself. As blood and other fluids accumulate below, the translucent nail plate appears to have turned black or black-blue. According to Dr. Gennady Kolodenker, a podiatrist in Irvine, CA, traumatic injury is the leading cause of nail discoloration. This causes blood to collect in the tissues beneath the surface of the nail, a condition medically referred to as subungual hematoma, resulting in a discoloration of the nail plate. In addition to darkening of toenails, trauma is often associated with intense pain. You can for example get a dark spot from running (e.g. a marathon), jogging, and hiking as well as participating in soccer, basketball, skiing etc. with tight-fitting athletic shoes that leaves limited space for toe movement. This causes the toes to consistently bang against the inside of the shoes. Athletes who don’t trim their toenails can make the problem even worse. Accidental trauma from violent impact on the toenails e.g. when another footballer steps on your toes or a heavy object lands on top of your toenail, can also cause darkening. In addition to dark spots, traumatic injury can in some cases cause lifting of the toenails. Although commonly associated with yellow toenails, toenail fungus can also cause green or dark toenails. Contaminated manicure equipment can transmit toenail fungus. People who walk around barefoot in wet public facilities such as changing rooms, public showers, locker rooms, gyms, etc. are at higher risk of toenail fungal infection. Diabetics and elderly people are also at higher risk of developing nail fungus. Toenail fungus is associated with mild to severe pain that may be intermittent or constant in addition to other symptoms such as thickening of the nails. From big toe to pinky (little) toenail, any digit can be affected. It can also occur on one or both feet. 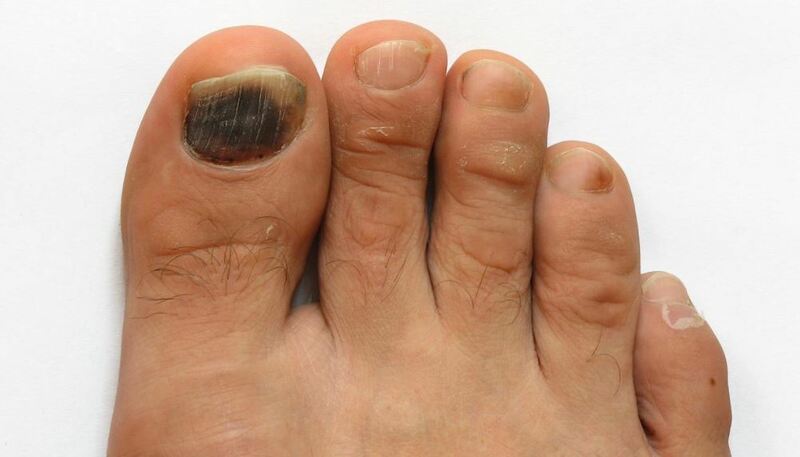 Persistent black spots under the toenail that is not associated with injury (trauma) and doesn’t respond to treatment with home remedies may be an indication of melanoma (skin cancer). This is nevertheless a rare occurrence according to the American College of Foot and Ankle Surgeons. It is advisable to have a doctor rule out melanoma. This is another rare cause of darkening of toenails according to the American College of Foot and Ankle Surgeons. What if you have black (or black-blue) toenail but no pain whatsoever? Well, if you have sustained a dark spot from a traumatic injury i.e. subungual hematoma, but there is no pain or tight pressure at all, you can skip treatment. The toenail will heal itself with time. If you don’t recall a trauma on the toes and you are sure that factors such as tight-fitting footwear are not to blame for the problem, then it is advisable to try using one of the home remedies listed in the next section of this article. If they still don’t help, it is time to call a doctor to rule out other causative factors especially melanoma. Black marks on your toenails can make you feel uneasy about wearing open-toed shoes and flip-flops. They can also make you pretty uncomfortable if painful. Mix vinegar with twice the amount of warm water. Soak your feet in the solution for half an hour or so. Dry your feet thoroughly, paying special attention to the toenails. Repeat 2 to 3 times daily until the affected toenails heal. Mix 1 cup of vinegar with enough water to make a solution in which you can soak our feet. Soak your feet in the solution for 25 minutes, then pat them dry. Add 5 tablespoons of baking soda in a small basin, then add enough water to enable you to soak your feet in. baking soda is fungistatic in nature, meaning that it will inhibits growth and spread of foot fungus. Soak your feet in the baking soda “solution” for 15 minutes, then pat dry. Repeat this home treatment twice daily to get rid of the spot. Thanks to its powerful antimicrobial properties, tea tree oil is solidly retaining its special place among home remedies for not only blackened toenails but also many other skin conditions such as acne, dandruff, etc. In a small basin, add 4-5 drops of tea tree oil. Add enough water to cover your feet. Soak your feet in the solution for 20 minutes. Repeat this home remedy two times daily, in the morning and evening. Mix 1 teaspoon of tea tree oil with 1 teaspoon of coconut oil or olive oil (Grapeseed oil and orange oil will also work fine). Apply the oil mixture onto unpolished toenails with a cotton ball. Let it stay on for 10-15 minutes then wash it off gently with warm water and a toothbrush. Use this remedy twice or thrice daily to get rid of dark toenails. Epsom salt is also hailed as a great treatment remedy. It helps to soother pain and reduce bruising. Mix ¼ cup of Epsom salt with about 10 cups of warm water. Soak your feet in the solution for 15-20 minutes. Repeat the process 2-3 times daily. It is however not advisable to place ice directly on the skin; instead wrap it in a clean washcloth and then gently pat the bruised toenails. Frozen peas can also be used for the purpose. Vicks vapors Rub is also very popular a treatment for nail discoloration. Apply generous amount of the ointment of the affected toes twice daily, in the morning and evening, after cleaning and patting dry your skin. Orange oil is also a great remedy for bruised toenails, thanks to its antifungal properties. Wash your feet with warm water and soap. With the help of a dropper, apply orange oil on and beneath the toenails, and between the toes. Let it stay on for 30 minutes. Repeat twice or thrice daily until the toenails get cured. Oil of oregano is also hailed for its ability to kill foot fungus and other microorganisms and thus get rid of black spots on toenails. Combine 2 parts oil of oregano with one part olive oil. Apply the oil-mixture on the toenails. Allow it to work in for 30 minutes. Use this home remedy one or two times each day to get the desired results. Garlic is also acclaimed as one of the best home remedies for black toenails. This is attributed to the anti-fungal properties of various bio-compounds in it, including allicin and ajoene. Mix 1 tablespoon each of garlic oil and white vinegar. Stir thoroughly till well blended. With the help of a cotton ball, apply the mixture on the blackened toenails, then cover them with a bandage. Allow the mixture to work in for 1 hour, then wash off with water. Repeat once daily until the problem gets cured. Rich in citric acid, lemon juice has antifungal and antibacterial properties. It helps to kill and stop growth of toenail fungus. Clean your feet with warm water and soap, paying close attention to the toenails. Apply freshly squeezed lemon juice on the afflicted toenails. Rinse it off with warm water after 30 minutes. Mix lemon juice with equal proportion of olive oil. Massage the mixture on the affected toenails. Allow it to work in for 1 hour or more. Stop using nail polish and removers for a while as you treat the problem. Have a balanced diet. Also, consider taking multi-vitamin supplements to boost your immune system. Ensure manicure equipment are sterilized before use. There you go; that is how to get rid of black toenails. If the darkening persists however, it is advisable to see a doctor. Hydrogen Peroxide for BV: Is it Safe to Use with Tampon, Douche Treatment?